For other people named Sean Taylor, see Sean Taylor (disambiguation). Sean Michael Maurice Taylor (April 1, 1983 – November 27, 2007) was an American football player who was a free safety for the Washington Redskins of the National Football League (NFL) for four seasons. He played college football for the University of Miami, was a member of the Hurricanes' 2001 BCS National Championship team, and earned unanimous All-American honors. The Washington Redskins chose Taylor with the fifth overall pick of the 2004 NFL Draft. Due to his ferocious hits, several of his Redskins teammates nicknamed him "Meast," a portmanteau word from the expression "half man, half beast." Taylor died at the age of 24 on November 27, 2007, from critical injuries from a gunshot by intruders at his Miami area home. His death led to an outpouring of national support and sympathy, especially in the Washington, D.C. area, where Taylor had been a fan favorite as a Redskin, and the Miami area, where Taylor had starred for the Miami Hurricanes, after leading Gulliver Prep to a Florida state high school championship and setting a state record for most touchdowns in a season (44). Tight end Chris Cooley, tackle Chris Samuels, and long snapper Ethan Albright honored Taylor at the 2008 Pro Bowl by wearing his number 21 rather than their usual numbers. To honor Taylor in the first game following his death, the Redskins defense lined up ten players on the field against the Buffalo Bills leaving Taylor's traditional position of free safety vacant for the first defensive play. Sean Taylor was born in Florida to Pedro Taylor, a policeman, and Donna Junor. He spent his early years growing up with his great-grandmother Aulga Clarke in Homestead, Florida and later moved to his father's home at the age of 11. He grew up in a low-income neighborhood in Miami, on a street lined with candy-colored houses. Taylor played high school football in Pinecrest, a suburb of Miami. He originally began his high school football career at Miami Killian High School, a Class 2A public school, but transferred to Gulliver Preparatory School, a Class prep school, where he was a three-sport star in football, track and basketball. He played both offense and defense. Despite missing the first game of the season (the team's only loss), he helped Gulliver win the Florida Class 2A State Championship in 2000 with a 14–1 record. Taylor was a star on both sides of the ball during that season, playing running back, defensive back and linebacker. He rushed for 1,400 yards and a state-record 44 touchdowns and on two separate occasions, rushed for more than 200 yards during Gulliver’s state playoff run. He also compiled more than 100 tackles during the season and scored three touchdowns (two receiving, one rushing) in the state title game victory over Marianna High School. In track & field, Taylor won the state 2A 100-meter dash in 2000 and was also one of the state's top 400-meter dash sprinters. At Gulliver, Taylor was a teammate of future NFL player Buck Ortega. His championship HS team was coached by Steve Howey, Ralph Ortega, Dirk Moran, Lee Horn, Dave Burns, and John McCloskey. Taylor was considered the No. 1 prospect in Miami-Dade County by the Miami Herald. He was also rated the nation's No. 1 skill athlete and an All-American by Super Prep. Taylor was also an Orlando Sentinel Super Southern Team selection, the No. 1 athlete on the Florida Times-Union Super 75 list and rated the No. 1 player in Florida by The Gainesville Sun. In 2007 he was also named to the Florida High School Association All-Century Team, which selected the Top 33 players in the 100-year history of high school football in the state. After his death, Taylor was honored at Gulliver by a plaque that was placed in the school's cafeteria. The football field at Gulliver Prep was renamed Sean Taylor Memorial Field on September 5, 2009. Taylor was recruited to play for coach Larry Coker's Miami Hurricanes football at the University of Miami. He was also a member of the Hurricanes track & field team, competing in events such as the 100-meter and 200-meters. As a freshman (he was one of just four true freshmen to play for the team), Taylor carved a niche for himself in Miami's secondary in nickel and dime defensive schemes . During the season, Taylor was named Big East Special Teams Player of the Week for his performance against the Pittsburgh Panthers. The Hurricanes won the national championship in 2001, their fifth national championship since 1983. In 2002, his first season as a starter, Taylor was a second-team All-Big East selection by the league's head coaches. He finished third on the team in tackles with 85 (53 solo), broke up 15 passes, intercepted 4 passes, forced one fumble, blocked one kick and returned a punt for a touchdown. He led all Miami defensive backs in tackles, interceptions and passes broken up, and had a career-high 11 tackles (2 solo) and intercepted 2 passes in the Fiesta Bowl loss to Ohio State. One interception occurred on an infamous play where he was stripped by Maurice Clarett on the return, allowing the Buckeyes to retain possession. Taylor produced a historic season during his final year at Miami that culminated with a plethora of honors and awards. He was named a unanimous first-team All-American, the Big East Conference Defensive Player of the Year and a finalist for the Jim Thorpe Award, given to the nation's best defensive back. He led the Big East Conference and ranked first nationally in interceptions with 10, tying the record for interceptions in a season with former Hurricanes standout Bennie Blades. Taylor also finished first in total tackles with 77 (57 solo). He intercepted two passes in Miami's impressive 28-14 win over Pittsburgh, playing a key role as the Hurricanes limited All-American receiver Larry Fitzgerald to just three receptions for 26 yards. He returned interceptions for an average of 18.4 yards, including a 67-yard touchdown return at Boston College, a 50-yard scoring runback at Florida State and a 44-yard scoring runback against Rutgers University. His three touchdown returns of interceptions is a Miami single-season record. Taylor also competed in track & field as a senior for the Hurricanes. He placed 4th in the 100-meter at the Gatorade Invitational in Coral Gables, Florida with a time of 10.77 seconds, behind teammates Terrell Walden, Roscoe Parrish and Travarous Bain. His best efforts for the season came at the Big East Outdoor T&F Championships in Storrs, Connecticut, where he ran personal-bests of 10.74 seconds in the 100-meter dash and 21.60 seconds in the 200-meter dash. He also participated as a member of the 4x100 relay. Following his 2003 season, Taylor announced that he was entering the NFL draft. Taylor was drafted in the first round (fifth overall) by the Washington Redskins. The drafting of Taylor by the Redskins in the first round began an NFL Draft record where six players from the University of Miami were drafted in the first round (the other five players were Kellen Winslow II, Jonathan Vilma, D. J. Williams, Vernon Carey and Vince Wilfork). Following his selection by the Redskins, Taylor signed a seven-year, $18 million contract with the team. However, problems soon began for Taylor as he fired his agent and then skipped part of the NFL's mandatory rookie symposium, drawing a $25,000 fine. Over his first three seasons, Taylor also was fined at least seven times for late hits, uniform violations and other infractions. On the field during the 2004 season, Taylor was successful, emerging as the Redskins' starting strong safety by the third game of his rookie year. Starting the remaining 13 games of the season, Taylor finished the year with 89 tackles, two forced fumbles, one sack, 9 passes defended and 4 interceptions (second-highest on the team). Before the season started, Taylor switched his jersey number from #36 to #21 after the cornerback who had worn number 21 the year before, Fred Smoot, a close personal friend of Taylor, had left the team and signed with the Minnesota Vikings. Taylor kept the number when Smoot rejoined the Redskins in 2007, with Smoot opting to wear #27 (his number from Minnesota). Taylor continued his effective play in the 2005 season, finishing with 70 tackles, 2 sacks, 2 forced fumbles, 2 interceptions, 10 passes defended and 1 fumble returned for a touchdown. Taylor, along with fellow University of Miami and Redskins teammate Clinton Portis, was fined $5,000 in the home game against the Philadelphia Eagles for violating the NFL dress code by wearing socks that did not match the Redskins' standard uniform. Taylor had ups and downs during a January 7, 2006 wild card game against the Tampa Bay Buccaneers. Although he scored a touchdown that proved to be the Redskins' game-winning touchdown, he was ejected after spitting at Buccaneers running back Michael Pittman. He was subsequently fined $17,000, the amount of his game bonus check. 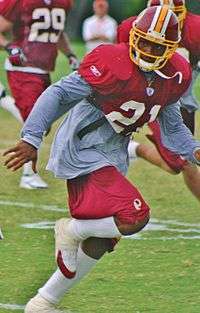 In 2006 Sean Taylor finished the year leading the Redskins' defense with 129 tackles and also had 1 interception, 6 passes defended and 3 forced fumbles. During the season, Washington Redskins assistant coach Gregg Williams frequently called Taylor the best athlete that he had ever coached. In Week 9, Taylor returned a blocked Mike Vanderjagt field goal into Dallas Cowboys territory and was awarded a 15-yard penalty after Kyle Kosier grabbed his facemask. This set up the winning field goal by Nick Novak. Three weeks later in Week 12, Taylor had his best game of the season against the Carolina Panthers. Though he played well throughout the game, his presence was felt most sharply in the final minutes in which he made a key 4th-down tackle to prevent a 1st down and intercepted Jake Delhomme to seal the victory. He earned NFL Defensive Player of the Week honors following the game. Even while playing on a struggling Redskins defensive unit, Taylor's impact on the field was recognized when he was named a first alternate to the NFC's 2007 Pro Bowl team. When the NFC's first choice for safety, Brian Dawkins of the Philadelphia Eagles, chose not to play in the Pro Bowl due to an injury, Taylor was named to the vacated spot, marking his first and only Pro Bowl appearance. A crushing hit by Taylor on Buffalo Bills punter Brian Moorman in the Pro Bowl created much fan and media discussion. Prior to the start of the 2007 season, Sports Illustrated named Taylor the hardest-hitting player in the NFL. Before the season, in a rare interview, he was quoted as saying, "[Y]ou play a kid's game for a king's ransom. And if you don't take it serious enough, eventually one day you're going to say, 'Oh, I could have done this, I could have done that.'" The season appeared to represent a personal turnaround for Taylor, as teammates said that he had finally gotten his life straightened out because of his daughter. Also before the season, the Redskins decided to use Taylor in a more traditional free safety role with less responsibility. At the time of his death, Taylor was tied for the most interceptions in the National Football Conference and second in the league with 5 despite having missed Weeks 11 and 12 with a knee injury. Playing at a high level, Taylor had also compiled 42 tackles, 9 passes defended and a forced fumble. On December 18, 2007, Taylor was posthumously voted to his second Pro Bowl, becoming the first deceased player in NFL history to be elected to the Pro Bowl. During the Pro Bowl, Chris Samuels, Chris Cooley and Ethan Albright wore Taylor's #21 jersey to honor him. Like the Redskins had done earlier in the season, the NFC lined up with just one safety on the first play of the game. Taylor was arrested in Fairfax County, Virginia at 2:45am on October 27, 2004 for allegedly driving under the influence of alcohol following a birthday party in Washington for former Redskins receiver Rod Gardner. Pulled over for driving 82 mph on the Beltway, where the speed limit is 55 mph, Taylor failed a field sobriety test and then refused a blood alcohol (BAC) test, which resulted in his arrest. A Fairfax County judge acquitted Taylor of the charges in March 2005 after viewing a videotape of Taylor's roadside sobriety tests that, according to the judge, failed to demonstrate obvious intoxication. Taylor was, however, convicted for refusing to take a blood alcohol test requested by a Virginia state police officer. But when this case was heard on appeal in March 2005, Taylor was acquitted of refusing to take the BAC test, with the judge ruling there was a lack of probable cause for the request. On June 3, 2005, Taylor was named publicly as a "person of interest" by Miami-Dade County police in regard to a Miami assault case involving firearms, and was being sought for questioning. "We need to speak to him, we don't know if he's a victim, witness or suspect," Miami-Dade police spokesman Mary Walters said. Taylor allegedly was present at, and possibly involved in, an incident on June 1 in which bullets allegedly were fired into a stolen vehicle. On June 5, ESPN and the Miami Herald both reported that Taylor, accompanied by his lawyer, had surrendered to Miami-Dade police at approximately 10pm EST on June 4 at the Cutler Ridge district police station, from which he was transported to the Turner Guilford Knight correctional facility. He was charged with aggravated assault with a firearm (a felony) and misdemeanor battery. Miami-Dade police issued a statement the same day confirming the earlier reports. Taylor had allegedly pointed a gun at a person over a dispute over two ATVs that he claimed were stolen. The Associated Press reported that Taylor was held in detention at Turner Gilford Knight and released the evening of June 4 after posting bond of $16,500. The Miami-Dade County Clerk's Office announced that he would soon be officially arraigned on the charges. The Washington Post reported on March 3, 2006 that Taylor's trial had been postponed until April 10. Days before that date, the trial was moved back once more, this time by a week, because of conflicts with Passover and Easter celebrations. Taylor's house had been burglarized in his absence on November 18, 2007. Media reports briefly described the police reports of the circumstances surrounding the first burglary. Among the details noted were that the intruders pried open a window to climb into the home, went through the desk and safe that were located in Taylor's bedroom, also damaged an air conditioning unit. This report had been made by Taylor's mother, who had checked on the home and discovered the burglary. The police report did not specify if anything was stolen from the home, presumably because his mother would not know the contents of the desk or safe located in his bedroom. Eight days after the original burglary, on November 26 at 1:45 a.m. EST, Taylor was shot in the upper leg by an armed intruder at his home in Palmetto Bay, Florida, where he had been recuperating from a football injury. His femoral artery was hit and severed, causing a mortal wound. His longtime girlfriend, Jackie Garcia (a niece of actor Andy García), hid under the bedding with their 18-month-old daughter Jackie. Garcia then called 9-1-1 from her cell phone. Taylor was airlifted to the Ryder Trauma Center at Jackson Memorial Hospital in Miami, where he underwent surgery. He emerged from surgery about 12:30 p.m. He had lost a significant amount of blood and remained in a coma. His doctors speculated he may have suffered brain damage due to the blood loss, and an unnamed Redskins source reported that Taylor's heart stopped twice during the emergency surgery. After three hours, on November 27, Taylor died at the hospital at 3:30 a.m. The news was released to the media by Richard Sharpstein, a family friend who learned the news from Taylor's father around 5:30 a.m., and by Drew Rosenhaus, Taylor's agent. On November 30, Florida Department of Law Enforcement and Miami-Dade police detained four people in the Fort Myers area for questioning in connection with Taylor's death. The Miami Herald reported that investigators believe the four learned of Taylor's house through someone who unwittingly set up the burglary by bragging about his wealth. Later that night, Miami-Dade police spokeswoman Linda O'Brien announced that four men—Venjah K. Hunte, 20; Eric Rivera, Jr., 17; Jason Scott Mitchell, 19; and Charles Kendrick Lee Wardlow, 18—had been arrested and charged with Taylor's murder. Police director Robert Parker added that authorities had more than one confession but would not elaborate. All four men were charged on December 1 with felony second-degree murder, armed burglary and home invasion robbery with a firearm or another deadly weapon, charges carrying a maximum of life in prison. Around 2:30pm on May 13, 2008, a fifth suspect—16-year-old Timothy Brown—was arrested in connection with the murder. On May 14, Brown was charged with first-degree murder and armed burglary of an occupied dwelling. All murder charges were subsequently moved up to first-degree murder. In addition, it turned out that three of the suspects in Taylor's murder were involved in the November 18 burglary. The death penalty, however, was not sought because the gunman was the 17-year-old Rivera. Very few people in the region, not even Taylor's father, knew that Taylor was at home. The intruders made lots of loud noises prior to attempting to break down Taylor's door, suggesting that they did not think the home was occupied. That a knife was left on Taylor's bed during the November 18 intrusion as a "message." Sharpstein recently clarified that the knife was a kitchen knife used by the intruders to pry things open during the first invasion and was tossed aside on the bed of Taylor's sister. That the phone lines to Taylor's home had been cut prior to the November 27 invasion in which he was shot. This was refuted by police investigators, who clarified that the residential phone simply was not working. That the intruders did not steal or intend to steal anything during either invasion of Taylor's home. The first police report did not address whether anything was stolen from Taylor's home. Although the police report mentioned that the desk and bed in Taylor's bedroom were rifled through, it did not specify if anything was stolen, presumably because when his mother filed the police report Taylor was not present to indicate if any of his belongings had been taken. Criticism emerged of the way in which the media covered Taylor's death. Then Arizona Cardinals safety Antrel Rolle, for example, made unsubstantiated statements about individuals from Taylor's past who despised him for no longer associating with them - statements which garnered as much attention as did the observations of experienced police detectives. A backlash also occurred against the pigeonholing of Taylor as a stereotypical victim of black-on-black gun violence and against his characterization as a troubled youth headed toward certain destruction because of his past transgressions, while ignoring the circumstances surrounding his death. On December 3, 2007, 4,000 people attended Taylor’s funeral service held in Pharmed Arena at Florida International University. The entire Redskins organization attended the funeral and took up a section of the arena, traveling the day after a home game against the Buffalo Bills and two days before another home game against the Chicago Bears. Speakers at the nationally televised funeral service included NFL Commissioner Roger Goodell, then-Redskins head coach Joe Gibbs, and current and former professional or collegiate teammates LaVar Arrington, Clinton Portis and Buck Ortega. Reverend Jesse Jackson and O. J. Simpson, whose children went to Gulliver Prep, Taylor’s high school, were in attendance. Also attending were numerous prominent University of Miami alumni, including former teammates. Many of Taylor’s teammates wept throughout the emotional service. Taylor’s daughter Jackie sat in front with her mother, and wore a pin with her father’s jersey number 21 on the sleeve of her dress. In one of the eulogies, Taylor’s uncle Michael Outar told the audience, "I wanted him to play running back or quarterback and score all the touchdowns. The coach gave Sean number 66 and put him on the line. Before the game he said, 'Uncle Michael, what do I do?' I said, 'Hit the guy with the ball.' And that's what he did, over and over." Taylor was buried near his Palmetto Bay home. The NFL recognized the death of Taylor by placing a #21 decal on the back of all NFL players' helmets during all Week 13 games; additionally, a moment of silence was held before each game that week. Players on other teams were given the option to continue wearing the decals in subsequent weeks. Taylor was posthumously voted starting free safety for the NFC team for the 2008 Pro Bowl and voted a second team All-Pro. During their first defensive play, the NFC defense took the field with only 10 players in honor of Taylor. The Redskins had the number 21 painted on the field, at a parking lot entrance and in the Redskins Ring of Fame, all three of which became temporary memorials. In addition to the black #21 sticker on the back of every NFL helmet, the Redskins also wore the number as a patch on player uniforms, warmup shirts and coaching staff jackets, as well as unveiling a banner bearing his name and number. His locker at Redskins Park was encased in Plexiglas and left the same way Taylor had left it. The organization also established a trust fund for Taylor's daughter, Jackie. The first Redskins game after Taylor's death, on December 2, 2007 against the Buffalo Bills, was at FedEx Field. The game began with the Redskins defense playing with 10 men on the field instead of the usual 11. Players signaled to the sky, holding up the numbers two and one, on numerous occasions. The team requested everyone arrive 25 minutes before the start of the game at 12:40pm and played a four-minute remembrance video, held a moment of silence and gave attendees commemorative towels with Taylor's number on them in his honor and memory. The Redskins had a 5–6 record at the time of Taylor's murder. Following his funeral and the loss to the Bills, they won a Thursday night game against the Chicago Bears three days later. Washington went on a four-game winning streak to close out the season, which included a 27–6 home victory over division rival Dallas Cowboys in front of a record crowd to finish 9–7 and secure the final spot in the playoffs. With this win, the team became only the fourth team during the Super Bowl era to qualify for the playoffs following a 5–7 start. However, the Redskins lost to the Seattle Seahawks by 21 points during the first week of the playoffs. Teammates Chris Cooley, Chris Samuels and Ethan Albright all wore jerseys with No. 21 during the 2008 Pro Bowl. The three jerseys were auctioned off and the proceeds donated to the Sean Taylor Memorial Trust Fund. Taylor's number 21 has not been reissued by the team. It is not known at this time if it has been removed from circulation as being "unofficially retired," as the Redskins do not retire jersey numbers. When O.J. Atogwe, who wore number 21 with the Rams, signed with the Redskins, he said that he would not take number 21. At the Redskins game against the New York Giants on November 30, 2008, Clinton Portis ran down the field with a flag in the team's colors with the number 21 on it to honor the anniversary of Sean Taylor's death. They also painted the middle of the field with the number 21 instead of the Redskins symbol. Although originally scheduled for April 7, 2008, the trial of the men charged with Sean Taylor's murder was postponed to June 2009. The trial was postponed by petition of the defense, saying that there were still hundreds of potential witnesses who needed to be interviewed before the trial could proceed. The trial was delayed for a third time on June 9, 2009 for unspecified reasons. A new trial date was set for January 18, 2010, and was postponed again with a trial date of March 14, 2011. After another delay, the trial was set to begin on January 30, 2012. On May 12, 2008, it was announced the suspects, if convicted, would not face the death penalty, but may be subjected to life imprisonment because the suspected gunman, Eric Rivera, was only 17 at the time of the shooting. On May 15, 2008, Venjah Hunte, one of the five suspects in Taylor's murder, accepted a plea deal and was sentenced to 29 years in prison. On April 1, 2009, Hunte petitioned the court to withdraw his guilty plea. On January 20, 2012, a judge set a trial date of April 16 for Eric Rivera, Jr., the alleged gunman in the case. However, Rivera Jr. fired his lawyer on March 16, eventually causing delays. On July 12, the judge postponed the trial to November 5, but that date was further moved back to April 5, 2013 due to conflicting schedule with the chief prosecutor. On April 2, 2013, the trial was again postponed to August 12, 2013. In August, the trial was postponed to September 16, 2013. This was rescheduled to October 15, 2013. On November 4, 2013, a jury found Eric Rivera, Jr. guilty of second-degree murder and armed burglary. He still can face life in prison. On January 23, 2014, Miami-Dade Circuit Judge Dennis Murphy imposed a sentence of 57 1⁄2 years in prison. Rivera testified someone else fired the gun. On June 10, 2014, Jason Scott Mitchell was convicted in Taylor's murder and sentenced to life imprisonment. Charles Wardlow, the fourth person charged with the death of Taylor, was sentenced to 30 years in prison on April 1, 2015. The final defendant, Timmy Lee Brown plead guilty on April 8, 2015 and will serve 18 years in prison under his plea agreement. Sean Taylor was inducted posthumously into the Washington Redskins Ring of Fame on November 30, 2008. He joined 42 others and was the first player introduced to the ring since Gary Clark was inducted in late 2007. ↑ Demasio, Nunyo (April 25, 2004). "Redskins' Choice Is For Safety Concerns". Washington Post. ↑ "ESPN - Smith: Redskins' Taylor working to shed troublemaker image". ↑ "SI.com - Photo Gallery - Top 10 Hitters in the NFL". CNN. Retrieved May 23, 2010. 1 2 "Redskins Safety Sean Taylor Dies One Day After Being Shot in Home". Fox News. November 27, 2007. ↑ "McNabb to No. 2 in NFL jersey sales". The Washington Post. Retrieved May 23, 2010. ↑ ""Redskins remember slain Taylor, use 10 men on first defensive snap," ESPN, December 3, 2007". Sports.espn.go.com. 2007-12-03. Retrieved 2012-10-22. 1 2 3 4 5 Beras, Erika. NFL's Taylor responsive after shooting. The Miami Herald. November 27, 2007. ↑ "In life, and in death, Taylor was a natural mystery". ESPN. December 2, 2007. ↑ La Canfora, Jason (November 30, 2006). "Redskins' Taylor Put On the Hits Sunday". The Washington Post. Retrieved May 23, 2010. ↑ "Brian Moorman Remembers". The Washington Post. Retrieved May 23, 2010. ↑ "Redskins' Taylor Dies Day After Shooting". AP Newswire. November 27, 2007. Archived from the original on 2007-12-03. 1 2 "Archived copy". Archived from the original on 2008-03-31. Retrieved 2010-05-10. ↑ "Pro Bowl notebook Redskins Taylor honored". Nfl.com. 2009-01-31. Retrieved 2012-10-22. ↑ Demasio, Nunyo & Morello, Carol (2004-10-29). "Taylor Arrested On DWI Charge". Washington Post. Retrieved 2007-11-27. ↑ Foldesy, Jody (2005-01-06). "S. Taylor acquitted of DUI". Washington Times. Archived from the original on 2005-03-16. Retrieved 2007-11-27. ↑ Jackman, Tom (2005-03-11). "Redskins Player Wins Final Round of DWI Case". Washington Post. Retrieved 2007-11-27. ↑ "Safety charged with assault, battery". ESPN. June 5, 2005. ↑ "Taylor was named publicly as a "person of interest" in firearm-related assault case". Alaskareport.com. Retrieved 2012-10-22. ↑ LISA LUCAS Post Correspondent (2007-12-04). ""TRIBUTE TO SLAIN NFL STAR" - The New York Post, 12/04/2007 by Lisa Lucas Post Correspondent". Nypost.com. Retrieved 2012-10-22. 1 2 "Taylor responsive after shooting, surgery - 11/26/2007 - MiamiHerald.com". ↑ Marvez, Alex (2007-11-26). "Redskins safety Taylor awake, responsive". Fox Sports. Archived from the original (– Scholar search) on December 1, 2007. Retrieved 2007-11-26. ↑ Amy Shipley, Jason La Canfora (November 27, 2007). "Sean Taylor Dies in Miami". Washington Post. Retrieved 2007-11-27. ↑ Sedensky, Matt (2007-11-27). "Redskins safety Sean Taylor dies a day after being shot". Archived from the original on December 16, 2008. ↑ "Attorney Says 3 Detained In Taylor Investigation". Local10.com. 2007-11-30. Retrieved 2007-11-30. ↑ "Suspect in Taylor's slaying to serve 29 years in prison". Sports.espn.go.com. 2008-05-15. Retrieved 2012-10-22. ↑ "Police Theory". The Miami Herald. 2007-11-29. Retrieved 2007-11-29. 1 2 3 Shipley, Amy; Whoriskey, Peter (2007-11-30). "November 30 Washington Post Article". The Washington Post. Retrieved 2007-11-30. ↑ "First Police Report". The Miami Herald. 2007-11-26. Retrieved 2007-11-26. ↑ "CNN Police Report". CNN.com. 2007-11-26. Archived from the original on November 28, 2007. Retrieved 2007-11-26. ↑ "Black Journalists Criticism". maynardije.org. 2007-11-28. Archived from the original on 2008-01-17. Retrieved 2007-11-28. ↑ "LeBatard Criticism". The Miami Herald. 2007-11-29. Archived from the original on July 6, 2008. Retrieved 2007-11-29. ↑ "Sean Taylor makes Pro Bowl after being killed in house invasion". NFL. Retrieved 2007-12-18. ↑ Corbett, Jim (2008-02-11). "Peterson helps NFC roar back for Pro Bowl crown". USA Today. Retrieved 2008-10-20. ↑ "Redskins establish fund to benefit Taylor's daughter". NFL / Washington Redskins. Retrieved 2007-12-02. ↑ "To honor slain Taylor, Redskins use 10 men on first Bills play". Associated Press. December 2, 2007. Archived from the original on December 15, 2007. Retrieved 2007-12-02. ↑ "Pro Bowl 'Skins to wear jersey No. 21 to honor posthumous pick Taylor". CBS Sports. January 23, 2008. ↑ Shipley, Amy (February 27, 2009). "Trial Involving Shooting Death of Sean Taylor Postponed Until June". The Washington Post. Retrieved May 23, 2010. ↑ Shipley, Amy (December 8, 2010). "Trial delayed again in Taylor shooting". The Washington Post. Retrieved December 17, 2010. ↑ Reid Cherner & Tom Weir (June 11, 2009). "Sean Taylor murder trial still long way off". USA Today. Retrieved 2009-10-07. ↑ "Trial date set for Sean Taylor slaying suspects - ESPN". Espn.go.com. 2011-10-21. Retrieved 2012-10-22. ↑ "Taylor Murder Trial Postponed Until August". Sportsillustrated.cnn.com. 2008-03-28. Archived from the original on April 3, 2008. Retrieved 2012-10-22. ↑ Associated Press (2008-05-15). "Suspect in Taylor's slaying agrees to 29-year prison term". ESPN. Retrieved 2012-11-09. ↑ Associated Press (2009-04-02). "Man Wants Plea Withdrawn in Sean Taylor Case". The Washington Post. Retrieved 2012-11-09. ↑ CBSSports.com wire reports (2012-01-20). "Alleged shooter in Sean Taylor slaying to face trial April 16". Cbssports.com. Retrieved 2012-11-09. ↑ CBS Radio Inc (2012-03-16). "Sean Taylor's Accused Killer Fires Lawyer". CBS Miami. Retrieved 2012-11-09. ↑ Yahoo! Sports (2012-07-12). "Trial date set for Sean Taylor slaying trial". Retrieved 2012-11-09. ↑ Associate Press (2012-10-15). "Trial postponed for accused shooter of ex-UM, NFL star Sean Taylor". The Sun Sentinel. Retrieved 2012-11-09. ↑ Nathan Fenno (2013-08-05). "Trial in Sean Taylor's killing delayed again". The Washington Times. Retrieved 2013-09-01. ↑ "Man sentenced over 50 years for Taylor slaying". Sportsnet. January 23, 2014. Retrieved January 23, 2014. ↑ "Second man convicted of murder in Sean Taylor killing". June 10, 2014. Retrieved June 10, 2014. ↑ Taylor To be Inducted Into Ring of Fame at FedEx Field Archived November 8, 2008, at the Wayback Machine.